We all know we’re supposed to floss daily but let’s be honest – most of us don’t. Brushing is cleaning our teeth, so that should be enough is generally the notion felt by most. Flossing just seems like a step that feels unnecessary. That is until our dental checkups and hear, ‘How often do you floss?’ And now we are scrambling as we calculate how long it has been since we even thought about floss. Before you make up a lie about how often you really floss, let’s take a look at why it’s so important to floss daily. It may have you change your mind about ignoring dental floss. More effective than brushing alone. A toothbrush works to removing plaque but brushing alone has one big drawback: A toothbrush’s bristles can’t adequately clean between the teeth or under the gums. Flossing gets in those tiny spaces between your teeth to get everything your toothbrush can’t reach. Protects your gums. The main role of dental floss is to get in where your gums and teeth meet. Particles of food can get lodged here, and plaque in this area will harden over time to form tartar. The bad news is that plaque can only be removed with a scraper at your next dental appointment. Tartar buildup can lead to gingivitis. Helps prevent other diseases. Gum disease can have effects that go beyond discolored teeth, discomfort and bad breath. Research has shown that bacteria in an unhealthy mouth can harm the rest of the body, and lead to heart disease, diabetes and respiratory illness. 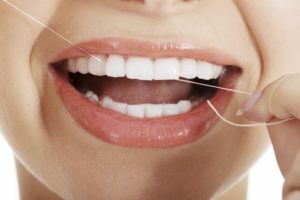 To learn more about flossing, please contact Dr Alhadef at 214-368-2434 to schedule a consultation or visit our website at www.dallascosmeticdental.com. Dr. Gary Alhadef, DDS proudly serves Dallas and all surrounding areas.